I think most of the books on my bookshelf are hers, LOL. Maybe because her writing is freaking amazing, and she's like the goddess of YA fantasy, science fiction, and paranormal romance. I've followed her around three different signings, and I can say that she's one of those authors that remembers her readers. She's sweet and funny all at the same time and knows how to have a good party! 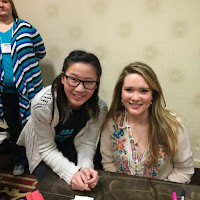 This picture was taken at Apollycon 2015 where I was able to meet the lovely Sarah J. Maas. Sarah J. Maas is just a natural born writer and a great storyteller. The Throne of Glass series is something else entirely, more unique than any book I've ever read before. I think her writing is fantastic and humorous with snarky commentary. If she writes anything else, I would be surprised to find myself on that aisle in Barnes & Noble. I owe Gena all of my love and appreciate because she is credited as one of the authors that got me into reading and blogging. Her writing is more specific in the paranormal and fantasy genre. She writes not too many YA but her NA books even I have enjoyed before. It's incredible that I've only read two books by Sanderson and I'm still in love with his stories and world-building! I hope to read more about his magic systems and characters that are both peculiar and intriguing. If you're one that appreciates world-building and great character development, pick up a Brandon Sanderson book! Lastly, the amazing Rachel Hawkins. She is the author of Rebel Belle, which I worshiped after I read it. I was lucky enough to get an early copy of Miss Mayhem, and I read it just a day after. If you have read Rebel Belle, you should know of the awesomeness of her writing and her ability to lure you into a great book. In the future, I want to read more of her Hex Hall series and hopefully get a little more into her other series, if she has any. Who are your top 5 Auto-buy authors? JLA is the only one that I've read! Blogger fail. Sarah J Maas is the one that I really need to catch up with soon as I think I'd love her books and I own a few of them. Why can't I just have more time to read! Ohh and Rebel Belle is on my TBR also.